On February 14, 2012 the Civic Federation published two blogs about an initiative that would provide for a countywide referendum on whether to eliminate the Cook County Recorder of Deeds office and transfer its functions to the County Clerk. The proposed referendum for the November 2012 ballot would give Cook County voters the opportunity to support or reject this modernization effort that would reform the governance structure of the County, consolidate similar administrative functions and realize potential cost savings for taxpayers. 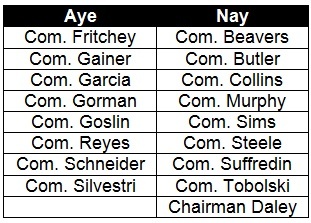 A public hearing was to be held at a special meeting of the Finance Committee on February 14, 2012; however, the meeting could not officially be called to order since only eight of the 17 commissioners were in attendance. Members of the public who had planned to testify were allowed to speak to those eight commissioners. The proposed resolution was then included on the meeting notice for the March 1st meeting of the Finance Committee. No notice of a public hearing was given. On March 1st, despite concerns voiced by resolution sponsor Commissioner John Fritchey, Finance Committee Chairman John Daley allowed speakers to testify without public notice. Current candidate for Recorder of Deeds Karen Yarbrough spoke against the proposed resolution, as did Kankakee County Recorder Lori Gadbois. Those members of the public who previously spoke on February 14th, including Civic Federation President Laurence Msall, were not able to testify before the full committee on March 1st because of the lack of notice of a public hearing. President of the Cook County Board of Commissioners Toni Preckwinkle did not take a public position on the resolution. The Civic Federation continues to support this important modernization of County operations. The following gives a brief history of the Federation’s support for reforming Cook County’s outmoded, inefficient governmental structure. Founded during the Progressive Era reform movement of the late 19th century, the Federation has always favored the implementation of the short ballot system of elections in which voters only choose candidates for the most important legislative and executive posts, leaving lesser administrative posts to be filled by appointment. The Federation also favors allowing the executive to exercise reasonable authority over key administrative functions such as finance and personnel; this is a necessary condition for the efficient operation of government. Currently, the County is a fractured unit of government, with executive control divided among multiple elected officials and offices. It is often difficult for the County Board President, who is now elected countywide, to develop and implement government-wide policies because of political resistance from independently elected officials with narrow constituencies. The decentralized governance structure also obscures responsibility for decisions, making it difficult for the electorate to hold the appropriate official accountable. The Civic Federation supports three types of governance reforms for Cook County government. Cook County should centralize key administrative functions such as information technology, human resources, purchasing, capital planning and financial management across all elected officials to improve operational efficiency. Under this plan, the Board President would appoint a qualified, professional Chief Administrative Officer and administrative departments would be headed by qualified professionals. The argument for changing the selection method for an office from election to appointment is that the office in question performs administrative or ministerial functions. These functions involve applying procedures or regulations as prescribed by law. They do not involve discretionary decision making. Policy making offices, in contrast, do require a degree of discretion on the part of the relevant official. The Civic Federation supports allowing the Cook County Circuit Court to appoint the Clerk of the Circuit Court (the Federation also favors allowing the Mayor of Chicago to appoint the City Clerk with the consent of the City Council). The Civic Federation has long favored consolidation of executive functions in Cook County government. In 1959 the Federation proposed consolidating all property tax administrative functions in an Office of Tax Administration. In 1994 the Civic Federation called for an independent, nonpartisan evaluation to determine the possibility of reducing the number of elected officials and/or consolidating functions. The Federation reiterated its support for consolidation of certain offices and/or functions in the 2010 Cook County Modernization Report and in testimony on February 14, 2012 supporting the merger of the Recorder of Deeds and County Clerk’s offices. A unified property tax administration office would merge the Treasurer’s office; the County Clerk’s tax extension, tax redemption and map divisions; the part of the Recorder’s office dealing with property records; and the Auditor’s property functions. It would be appointive. Several previous proposals had called for merging the assessor’s office into a unified property tax administration office. However, the Federation believes that this move could potentially compromise the integrity and independence of the property assessment process. Instead, assessment should be maintained separately from the property tax extension, redemption, collection and disbursement processes. Creating a unified Office of Property Tax Administration would require a county referendum. The Offices of County Clerk and the Recorder of Deeds should be merged. In Illinois counties with population of under 60,000 the county clerk is also the recorder. This is also the case in many counties across the nation. If the Office of Tax Administration discussed above was adopted, a consolidated Clerk-Recorder would retain responsibility for vital records and elections. Implementing this proposal would require approval by county referendum. The Reinventing Cook County report by Commissioner Quigley estimated in 2003 that this effort could save approximately $616,000 through elimination of duplicative functions. In FY2010 combined General Fund expenditures for both offices appropriated at $16.27 million. Assuming a 5% reduction in costs as a result of a merger, as much as $0.8 million could be saved. John Byrne, “County Board rejects referendum on closing recorder of deeds office,” Chicago Tribune, March 2, 2012. Civic Federation. Cook County Modernization Report: A Roadmap for Cook County Government. October 25, 2010, p. 10. Civic Federation. Cook County Modernization Report: A Roadmap for Cook County Government. October 25, 2010, p. 5. Civic Federation Statement on House Bill 1346, Seventy-First Session, Illinois General Assembly (1959). Civic Federation Statement Made on the Proposed Cook County FY1994 budget, November 19, 1993. Civic Federation. Cook County Modernization Report: A Roadmap for Cook County Government. October 25, 2010, p. 154. See Cook County Commissioner Mike Quigley, Reinventing Cook County, Part I,December 2003, pp. 20-22 and Civic Federation Statement on House Bill 1346, Seventy-First Session, Illinois General Assembly (1959). Illinois State Constitution Article VII Section 4(c) County Officers. Cook County Commissioner Mike Quigley, Reinventing Cook County, Part I,December 2003, p. 23. The report assumed a 5% savings from consolidation.